A Crealock design like "Entropy"
A fter my solo around-the-world sail between 1988 and 1991, I took a break from sailing, to see if I could live a normal life in a normal town (Ashland, Oregon). The answer, delivered by nature herself, was an unequivocal no. 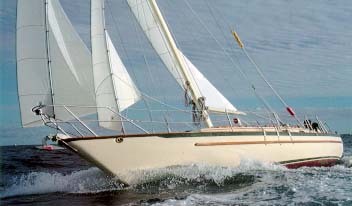 So I have moved to the Puget Sound area and bought another boat — a Crealock 37 which I have named "Entropy." And why "Entropy?" Think about it — a boat is an ideal example of gradual drift from perfect order to perfect disorder. Under the rules of physics, there can be local violations of entropy (an increase in order at one location), but only if the total entropy of the universe increases (increasing disorder ). So if I am having a nice day and things are coming together, it is only because some other boat just broke. And if I break something on my boat and a chain reaction of other disasters begins (as is so often the case), I can take small comfort in the thought that some other boat is spared for the day. I call this "boat physics." This sailing section is divided into two subparts — current and historical. The historical part contains articles and a book about my long (30,000 mile) sail in a Crealock 31 named "Selene." The current section will contain articles and stories as they unfold in this new phase of my sailing. The first article of the current section is called "The Boat-on-a-rock Problem" — it describes how I rescued another boat on my first outing in my new boat. I think some might call that a good start, and it explains why I didn't hit a reef that day — someone else did.